Wouldn’t you like to try butterbeer like it was meant to be made? An alcoholic butterbeer recipe that matches the one in the Harry Potter books? Butterbeer with a little alcohol content and warm? Well, that’s exactly what I wanted for a New Year’s Eve party that I attended over the holidays. So I decided to make my own alcoholic butterbeer recipe and I think my “adult” version of the butterbeer recipe turned out great! Unlike the recipes in our “Butterbeer Recipes” post, this one will contain alcohol and be served warm (just like in the Harry Potter books). This one’s also of my own making, so feel free to play around with the ingredients, the prep, and so on….just make sure to report back in the comments and let us know how yours turned out! I played around with the ingredients and amounts until I found what I felt was the best representation of the butterbeer recipe from Universal’s Wizarding World park, with alcohol added and warmed. Ultimately, I came up with the recipe, below. 1/3 cup light brown sugar — loosely packed! These are the basic ingredients and amounts for the butterbeer recipe. Now, the details of putting together the wizardly concoction! 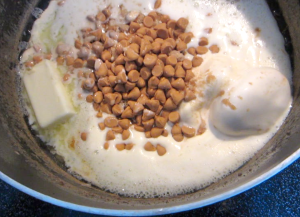 Start with the ice cream and butter in a large, deep saucepan or pot. Now, add in the brown sugar and butterscotch chips. Be sure the brown sugar is loosely packed. I know most recipes with brown sugar have you pack it in, but this butterbeer recipe is sweet enough as it is, you don’t need to add more sugar. 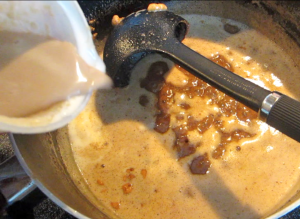 Now, before adding in any liquid ingredients, you want to heat and stir until all the butterscotch chips and ice cream has melted. Then, add in your Irish cream, first. We used Bailey’s, but any brand will work. The very last thing you want to add is the cream soda. We used A&W, but again, any brand will work. At this point, you don’t want to heat it much more, as the heat will take out the carbonation. I removed the butterbeer from heat immediately after adding the cream soda. As a side note, one mistake I made is that I made it too early on New Year’s Eve. For best results, you should serve the butterbeer immediately. Two things resulted from a delayed serving. 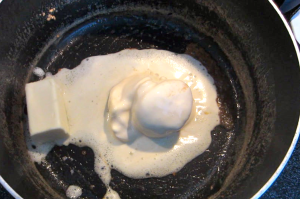 1) The butter began to “float” on the surface of the butterbeer as time went on. This didn’t affect the taste of the butterbeer, but it definitely affected the look. 2) The carbonation was all gone. Again, didn’t affect the taste, but lacked some of the “feel” of the butterbeer. The final result was a rich, sweet concoction that warmed the cockles and provided a nice little kick from the Bailey’s Irish Cream. To me, it tasted very similar to the Universal version of butterbeer with just a hint of alcohol. Just for informational purposes, I doubled the recipe, above to get more servings. I made it, though, just as shown above and just combined the final result into a bigger pot to double the recipe. This did not affect the flavor, in my opinion, just gave me more to serve. What about you? Let us know if you try this alcoholic butterbeer recipe or have created your own.